In 2011, Google, Bing and Yahoo came together to create a project called schema.org. This project consists of a series of HTML5 tags used to help search engines understand the content on a page. Google uses schema.org rich snippets to alter the appearance of SERP (search engine result page) listings; while Bing and Yahoo give a boost in organic search rankings for implementing it. What this means for webmasters is a new way to improve search performance from Bing and Yahoo, and to improve the likelihood a user will click on your search listing in Google. Take a phone number for example. To users, a phone number is a phone number, but to search engines, it is just a set of numbers. By adding schema.org microdata to the phone number like in the example above, both users and search engines will understand that it is a phone number. A telephone number is just one basic example of a schema.org rich snippet. There are hundreds of different item types and item props out there. There are dozens and dozens of other item types, but rather than listing them all, you can check out this list to see them all. More and more item types are added each year and are supported by the major search engines. These item props help search engines fully understand your content, and parse these rich snippets into SERP listings. The example above demonstrates how a SERP looks for a recipe page using rich snippets. Take note of the user ratings, image, and nutritional information. Without rich snippets, this would just be another boring SERP listing. Here’s an example of basic e-commerce rich snippets in action. Take note of the user reviews. 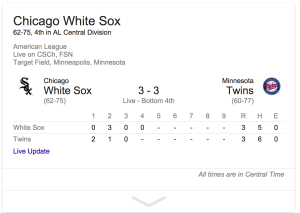 Another one you may see frequently is sports rich snippets. 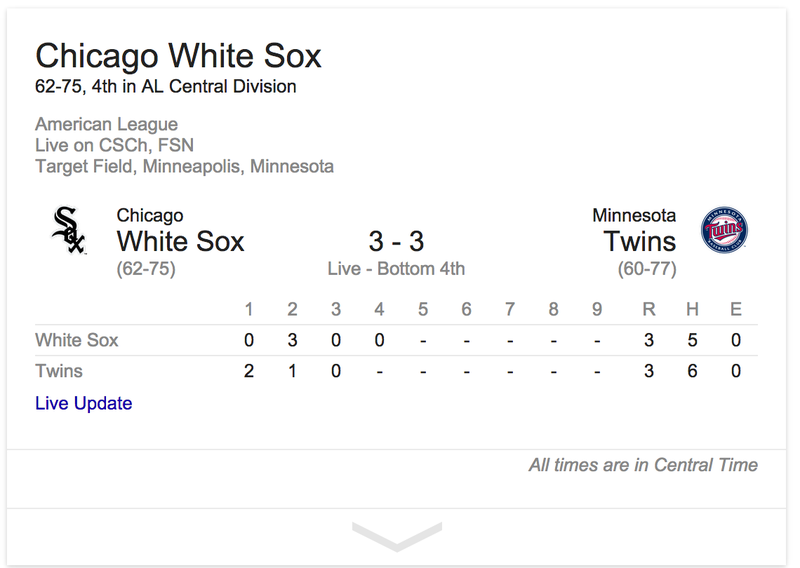 The above example shows the current score (Go White Sox! ), current standings, where the game is played, and what channel the game is on. This is all controlled using rich snippets. Are you taking advantage of schema.org microdata on your site yet? If you’d like to improve your site optimization and appearance in search, learn more about our SEO services here.